A recently conducted temperature benchmark test at the Photovoltaics Institut Berlin (PI) showed that ANTARIS SOLAR PV-panels of the type AS M 185 are outstandingly robust. Even when exposed to extreme temperatures no negative effects on module performance or components could be detected. 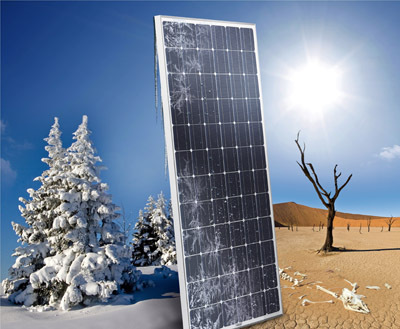 The ANTARIS SOLAR module is therefore ideally designed for use in hot regions and desert areas. Solar modules are made for sunshine. But even for pv panels solar radiation can have negative effects when it is too strong. Also, not all modules can cope with large variations in temperature. In a recently conducted temperature benchmark test the Photovoltaics Institut Berlin (PI) has tested solar modules of different providers for their behaviour under extreme temperatures. Therefore, modules where placed in a climate chamber and exposed to variations in temperature ranging from -40°C to 85°C. In the final stage of the test the modules had to stand nearly eight hours at a temperature of more than 85°C and one hour at over 100°C. The experiment showed that not all modules could cope equally well with extreme temperatures and large variations in temperature. After the experiments, several modules exhibited physical damages and further tests revealed a significant loss of efficiency for a part of the panels under consideration. The solar panel of ANTARIS SOLAR proved to be a positive exception. The AS M 185 module left the climate chamber without any physical damage and the following flash test proved unimpaired performance capacity. Dr. Ilka Luck from PICON SOLAR, that manages the QM-measures for ANTARIS SOLAR at the Photovoltaics Institute Berlin sums up the results of the temperature benchmark test: “Our experiment has shown that not all pv modules resist such large variations in temperature and extreme heat or cold.” Further tests supported the result that modules as robust as the AS M 185 from ANTARIS SOLAR are appropriate for long-lasting usage even under extreme temperatures and above-average solar radiation. Dr. Michael Göde, CEO of ANTARIS SOLAR is excited about the positive outcome: “The results show that the ongoing quality improvement of our modules pays off.” According to Göde, good heat-resistance is an important feature of ANTARIS SOLAR modules because they are intended to allow long-lasting usage even in areas with extreme climate conditions like tropic regions and deserts.